Enchanting bouquet of artificial Calla Lily to lighten up a friend's heart. Elegance and originality are the defining feature of this Calla Lily Vase arrangement. Chic and very stylish, the almost spherical White Vase is lined with Calla Lily Stems in pride of place. Cool and modern - without being consciously trendy - this new look for lilies shows all the signs of becoming a contemporary classic. Delicate and pretty, the faux flower used in this arrangement is from Fleurwood - Natural Latex Pink Calla Lily Flower. Detailed and beautifully realistic, it adds a wonderful touch of glamour. The real beauty of natural foam flowers is that they last forever; season to season in perfect bloom with no watering, pruning or wilting. At Giftlab we are passionate about imitating nature with absolute precision, and that's why we study real flowers and plants as a reference for each design. The results are blooms so lifelike that even the bees are fooled! Calla Lily available in White, Pink and Green. 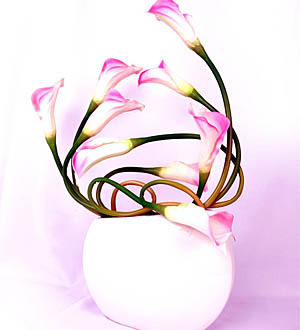 Each Calla Lily Flower Stem measures 67cm in length and the flower 8cm in diameter. Flower arrangement measures approximately 62cm in height with a diameter of 39cm.